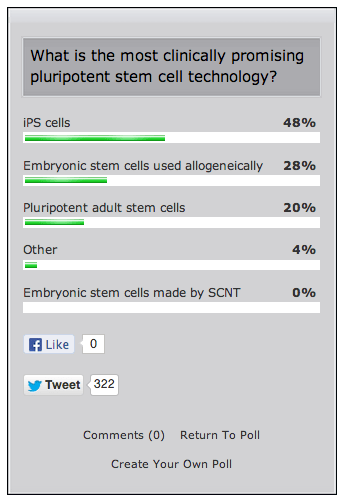 I just closed my blog’s poll on what are the most clinically promising pluripotent stem cells. Why close the poll now less than 12 hours after I opened it instead of leaving the poll open longer? You’ll find out soon enough. I can’t resist teasing you readers sometimes. iPS cells were the big winners in the poll at 48%. Allogeneic human ES cells were 2nd at 28%. In contrast, not a single person voted for SCNT-derived human ES cells. Pluripotent adult stem cells finished 3rd at 20%. I found this surprising. 4% said “other”….not sure what “other” pluripotent stem cells exist. I predict if (when) I repeat this poll soon, we’ll see a very different picture. Poll: What’s now most exciting in stem cell & regenerative medicine field? I find your polling results interesting, however I noticed that there was no mention of parthenogenetic stem cells mentioned…granted this could be encapsulated under the “other” topic, but as they are a relatively new and unknown field to the “layperson” but I would have thought you would have knowledge of them to include in your poll.